In 2011, we matched up two photos in the vast Library of Congress archives of 22,000 vintage pictures from American Colony collection. 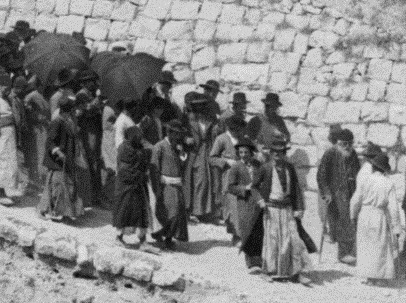 The pictures showed crowds of Jews walking between Jerusalem's Old City and the ancient Mt. of Olives cemetery, presumably for a funeral. Now it's time to match a third photo to the group. 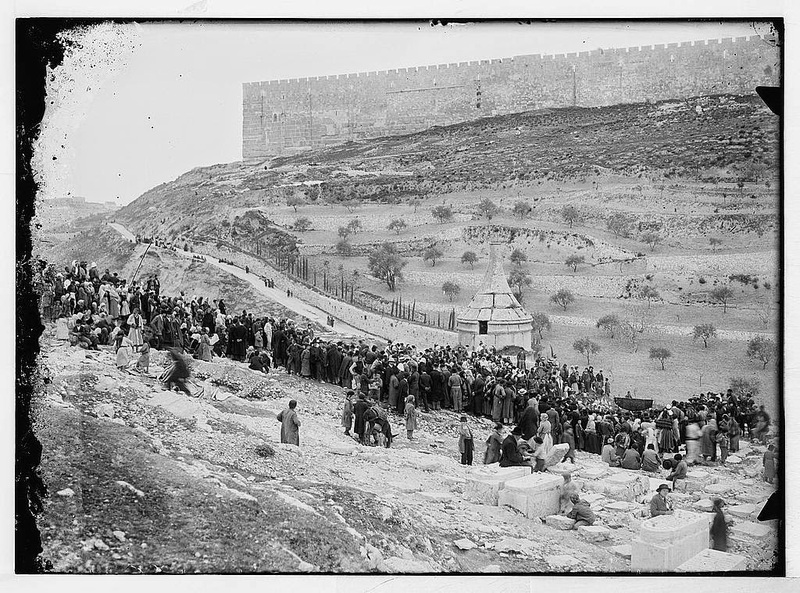 Thanks to a new exhibit at the Tower of David Museum in Jerusalem, we can assume that all three pictures show the crowds attending a "Shvartze Hasuna," a "Black Wedding" in the cemetery. 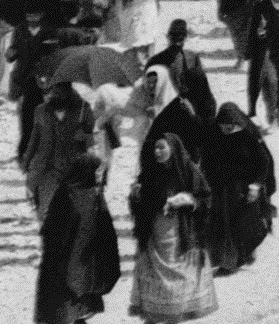 Indeed, upon enlargement, the two other pictures show many women and kids, an apparent anomaly for an ultra-Orthodox funeral 110 years ago. 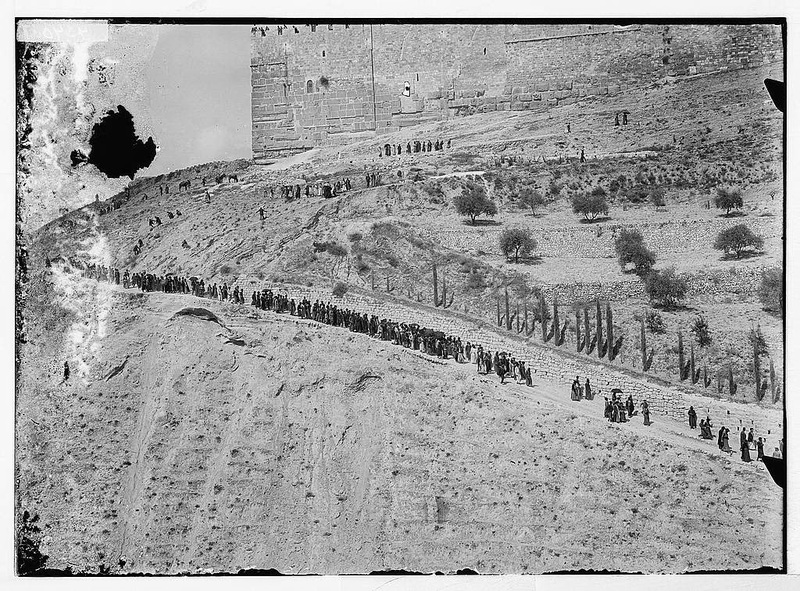 Jewish funeral procession to Mt. of Olives. Absalom's Pillar on Mt. of Olives. The Tower of David Museum exhibit on medical history in Jerusalem shows the picture at the top of this post. 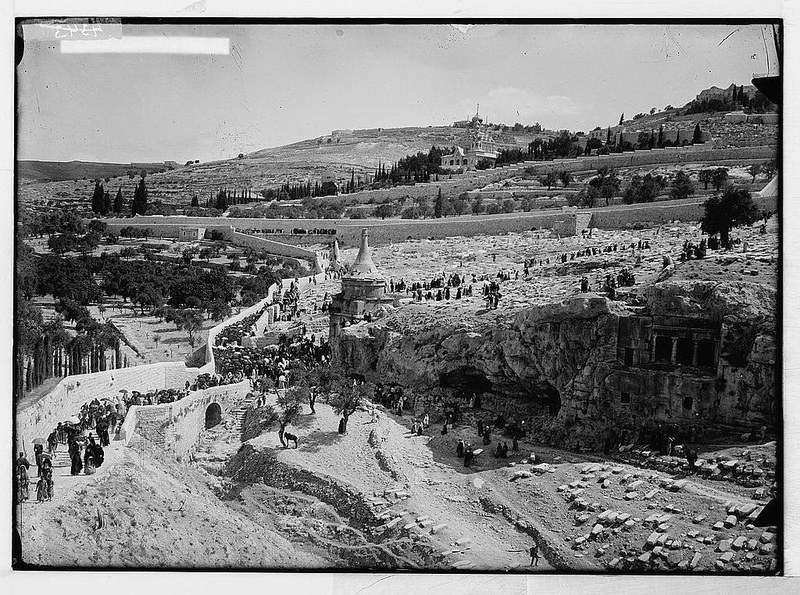 A museum guide told Ha'aretz' Ilene Prusher, “The Ashkenazi belief at the time was that if you marry two orphans you can stop the epidemic [cholera] or prevent the next one.” As a result of such a good community deed, it was believed, the souls of the deceased would intercede with God to stop the epidemic. Upon enlarging the Library of Congress picture, a black marriage canopy - a chuppa -- is apparent. The YIVO Institute for Jewish Research reports "Shvartze Chanesas" took place in the eastern European towns of Opatow (Apt) and Chelm. Another account by Marjorie Gottlieb Wolfe tells of such weddings in the towns of Pinsk and Ropshitz.